What is acupressure, and how is it different from massage? Acupressure, not to be mistaken for acupuncture, is an ancient art of healing by applying pressure to key healing points on the body. A massage is where the muscles are rubbed and stretched, applying pressure all over, and not on just a specific point. This healing technique was developed over 5, 000 years ago. Although acupressure and acupuncture therapy use the same pressure points and meridians, acupuncture uses needles, whereas acupressure uses gentle to firm finger pressure. Stimulation of these precise trigger points, causes the body’s natural self-curative abilities to wake up and start working. This type of therapy boosts the immune system, helping with preventive healthcare. 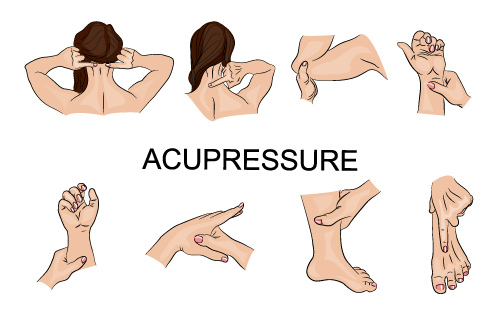 Acupressure also is very effective for stress relief. It increases circulation, releases tension, and reduces pain and stiffness. The great thing about acupressure is that you can do it yourself, once you learn where the pressure points are and what they do. When you’re receiving acupressure therapy, it’s best to close your eyes, breathe deeply, and try to relax. If it’s painful or uncomfortable, ask your therapist to ease off on the pressure. Some may think, “No pain, go gain”, it’s actually not true when it comes to self-healing. Pain will cause you to tense up and the therapy becomes less effective or even counterproductive. It’s best to reach a “good hurt” but not go beyond that. Remember, relaxation is key. Listen to your body and communicate with your therapist. Here’s a list of some commonly used pressure points. Gallbladder 20 (GB20): Feng Chi – This point is recommended for headache, migraine, eye blurriness or fatigue, low energy, and cold/flu symptoms. It is located by feeling the mastoid (ear) bone and following the groove back to where the neck muscles attach to the skull. Gallbladder 21 (GB21): Jian Jing – This point is located by pinching the shoulder muscle with your thumb and middle finger and is commonly used for stress, facial pain, headaches, toothaches and neck pain. Use with caution in pregnant women. Large Intestine 4 (LI4): He Gu – This point is good for stress, headaches, toothaches, facial pain and neck pain. However, as a word of precaution, it can induce labor and must never be used during pregnancy. Liver 3 (LV3): Tai Chong – You need to take off your shoe to find this point. This is an excellent area to stimulate for stress, low back pain, high blood pressure, limb pain, insomnia and emotional upset. Pericardium 6 (P6): Nei Guan – This point can help provide relief for nausea, anxiety, carpal tunnel syndrome, upset stomach, motion sickness and headaches and is even used for regulation of heart palpitations. Triple Energizer 3: Zhong Zhu – This point is located in the groove formed by the tendons of the 4th and 5th finger, behind the knuckles and is commonly used in the clinic for temporal headaches, shoulder and neck tension, and upper back pain. Spleen 6 (SP6): San Yin Jiao – This point can be very helpful for many urological and pelvic disorders as well as fatigue and insomnia. Avoid during pregnancy. Stomach36 (ST36): Zu San Li – You can find this point useful for fatigue and depression as well as knee pain and gastrointestinal discomfort. Asians frequently stimulate this point for health promotion and longevity. There are clear benefits of an acupressure therapy. If you have any discomfort or the aforementioned conditions, give this ancient healing technique a try. Listening to your body and improving your overall wellness improves your quality of life. Stress and pain reduction can happen in as little as 30 minutes; visit our Athens massage spa today!